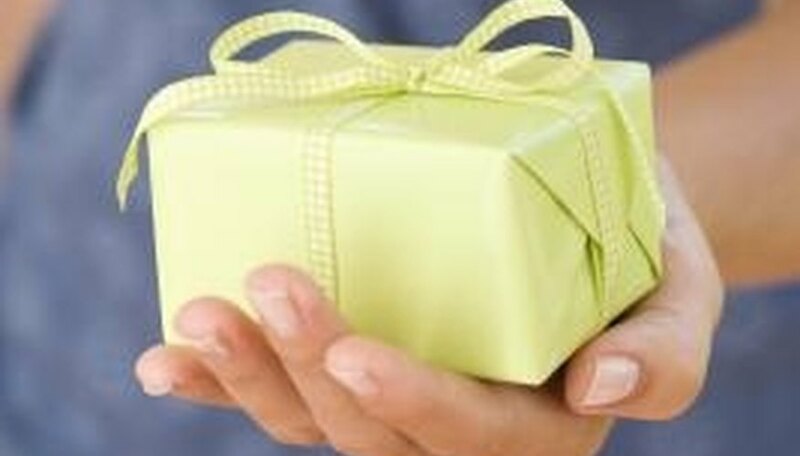 Choosing a gift for a boyfriend or husband for a one-year anniversary can prove difficult. He may want the newest video game system, but you want to get him something romantic that symbolizes your time together. Fortunately, you have several options for giving him an unforgettable gift he will not only appreciate but remember for years to come. Women often have a difficult time selecting an anniversary gift. A gift basket is easily personalized and relatively inexpensive. If you both are sports fans, buy some glasses printed with the name of his favorite team, a six-pack of his favorite beer and some snacks for a fun night in. If his tastes are more refined, a bottle of his favorite wine or Scotch and some fine cheeses and olives or other antipasti can't miss. If he isn't a drinker, a movie night basket might be his speed. Pick up some of those Blu-Ray discs he has been hinting about, and pair them with gourmet popcorn. Men have begun to appreciate jewelry as much as women. A gold or platinum watch with a special inscription on the back is always a winner. If your guy likes old-fashioned or heirloom pieces, an antique pocket watch or cuff links will make a unique gift. If he prefers gold chains, choose a special one for him, and he will have a timeless piece he can wear for years. If your partner has a sweet tooth, he will appreciate a special theme cake made just for him. Many bakeries around the country will make a designer cake featuring his favorite things, or even create a scene that represents the two of you as a couple. Expert bakers can incorporate photographs or even make miniatures of the two of you out of modeling chocolate. Take plenty of pictures so you can still enjoy looking at your masterpiece years later. The best gift may not be an item but an event. Plan a surprise date just for the two of you. Go back to that special restaurant where you went on your first date and after an elegant meal, go back to a hotel with a spa suite and spend some time alone to relax and remember why you fell in love in the first place. Smith, Natalie. "Romantic One-Year Gifts for Men." Dating Tips - Match.com, https://datingtips.match.com/romantic-oneyear-gifts-men-8039156.html. Accessed 18 April 2019.